This one's for you, Nate. Two days after Acer's announcement of the world's first 802.11ad laptop, and we now have a router that supports it. 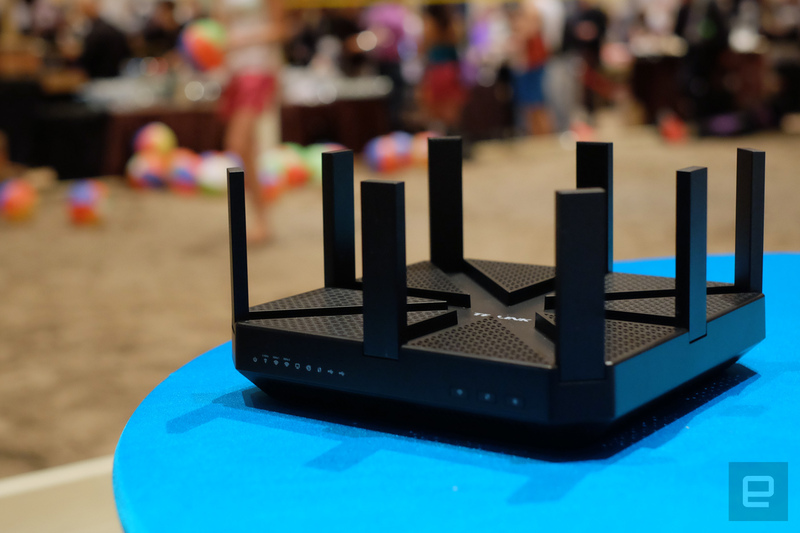 The TP-LINK Talon AD7200 is, obviously, the world's first 802.11ad router. What's 802.11ad? It's a 60GHz WiFi standard for that sits on top of the existing 2.4GHz and 5GHz bands. It's designed specifically for short-distances -- think line of sight, in the same room -- and tremendous speeds. The Talon AD7200 supports transfer rates of up to 7.2Gbps by combining multiple bands together. That makes it extremely useful for sharing files between devices or, for example, wirelessly streaming a 4K movie. When you're not in range, the router will still provide support for 802.11a, b, g, n and ac over 2.4GHz and 5GHz. As for the router... It's big, it's black, and it has eight antennas that can fold down flat for reasons. It's got two USB 3.0 ports for external drives and four gigabit ethernet ports. It's a router. It's probably an expensive one, too, but TP-Link isn't ready to announce the price just yet. It'll divulge such details closer to the router's launch in the second quarter.